What will more than likely turn out to be a major 'historic event' took place in St. Mellan's, Truagh, on Saturday evening, April 14th, when the preparations for a major international Treanor Clan Rally were begun. The local Treanor Clan had representatives present to meet with and listen to Monaghan man, now living in the US of A, Noel Treanor inform the gathering of the steps which have already been taken in America to make contact with and invite those descendants of Treanors to a four day Rally in Truagh in May 2019. Noel has been instrumental in carrying out a great deal of research on families who originated in North Monaghan and now living in the USA and Canada and to date he has almost 3,000 contacts made. He has also studied the life of many Treanors, with Monaghan connections, who became famous and he briefly gave the story of some of these. One he mentioned was a Thomas Treanor, who escaped from Kilmainham gaol in 1798 and succeeded in getting to the US. There he set up a Brewery and Bank and Ironworks and was a well-known business man. His partner was a Luther Parkes, who named his son Treanor Parkes, who later nominated both Lincoln and Grant as Presidents of America. There was a Winnie Treanor, who with two children survived the Titanic disaster. Her husband, who was already in America, sent the money for her and the two boys to travel 2nd Class to join him. She, to save money, bought 3rd Class tickets and when the sinking began was one of the first to the deck and managed to get herself and the boys away from the sinking ship. Noel has made contact with her descendents. There was also a Treanor who became a famous artist in America and lived in Stonewall Jackson's house. Her studio is now a preserved building. Noel has also discovered that there are over 1,000 Treanors in Spain and that a Thomas Treanor, who was a big business man in Valencia but he overstretched his business and went bankrupt but he was so popular that the people protested and as a result he was given a mansion in the city and it is there for all to see and two streets are named after him. There were Treanors, both male and female, who became famous as stars in Baseball and Volleyball and other sports. Noel also has a copy of a letter containing his last will and testimony, written by a James Treanor in the trenches during World War 1 and he was killed in action the following day. According to Noel this is only the tip of the iceberg of the stories and history of the Treanor Clan worldwide. Indeed the Treanor name is spelled in many different ways from Trenor to Traynor and Trainor but they more than likely all come from the same stock. The Treanor Clan in Monaghan are known to exist way back around the time of St. Patrick and it is reputed that McKenna, celebrating the killing of the stag at a party organised by Treanor fell in love with Treanor's daughter, stayed , married and raised a family at Liskenna. However reading history during the times of McKenna and McMahon, one seldom comes across a Treanor Chieftain and being Lord of many townlands. McKenna and McMahon were either fighting the invader or fighting each other but Treanor seemed to be more peaceful. However all will be revealed when the research plots the story down through the centuries to the present day and maybe we will hear the full story during the Rally in 2019. The Treanor gathering in St. Mellans: seated from L to R: Cllr Pat Treanor; Noel Treanor; Gerard Treanor; Frances Treanor; Annette Treanor/McKenna; Maureen Troy/Treanor; Kathleen Treanor. 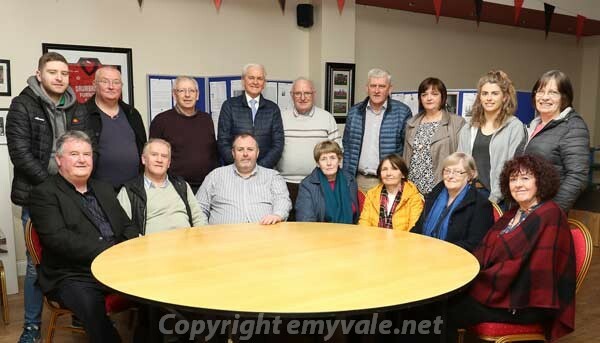 Back row: Niall Treanor; Noel Treanor; John Treanor; Cllr Seamus Treanor; Eugene Treanor; Fergus Treanor; Ann Treanor; Anne Marie McQuaid/ Treanor; Carmel Brady/Treanor. Noel Treanor, a Monaghan man living in USA and carrying out research and organising the Treanor Rally for May 2019. 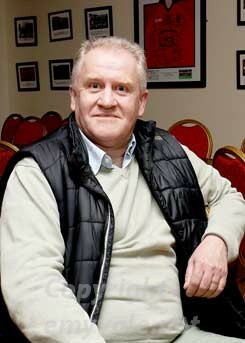 He has a number of Treanors already signed up to come to Truagh for the Rally.